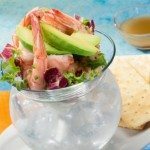 The Manhattan Avocado Cocktail | Food, glorious food! This quick and easy appetizer is sure to be a hit with your guests! In a microwave-proof cup, microwave the oil, garlic and cumin seeds, on high, 30 seconds to 1 minute, just until hot. Remove the garlic with a fork, whisk in the lime juice and salt. In a medium bowl, toss shrimp with 1 tablespoon of the dressing and the chile pepper. Place avocado slices in a 9” glass pie plate. Drizzle with 2 tablespoons of the dressing (whisking first with fork to blend). Shake dish to coat avocado. Press plastic wrap lightly over surface of avocado and seal around edge of plate. To serve: Toss greens with 1 tablespoon of remaining dressing. Divide greens among 4 martini glasses, mounding in center. Arrange shrimp and dot with tomato. 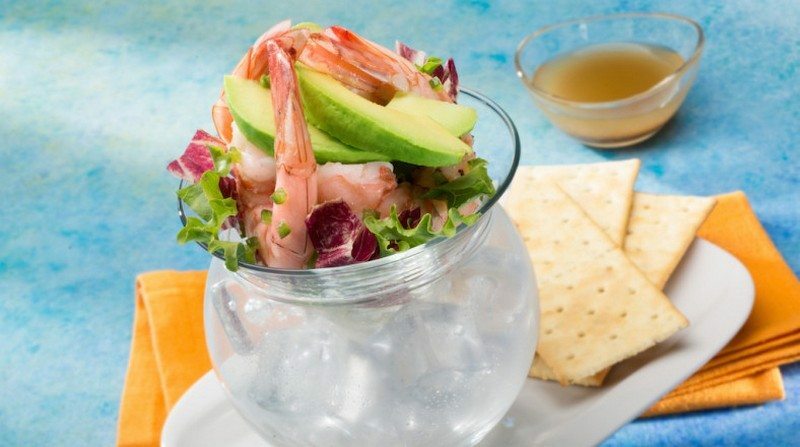 Decoratively stand avocado slices in glass, using the greens and shrimp to rest against. For scallops: In a large non-stick skillet, heat 1 teaspoon olive oil over medium-high heat. Sprinkle scallops with 1-2 minutes per side, until lightly browned. Cool. Proceed with recipe, adding the dressing.